Hello everyone! 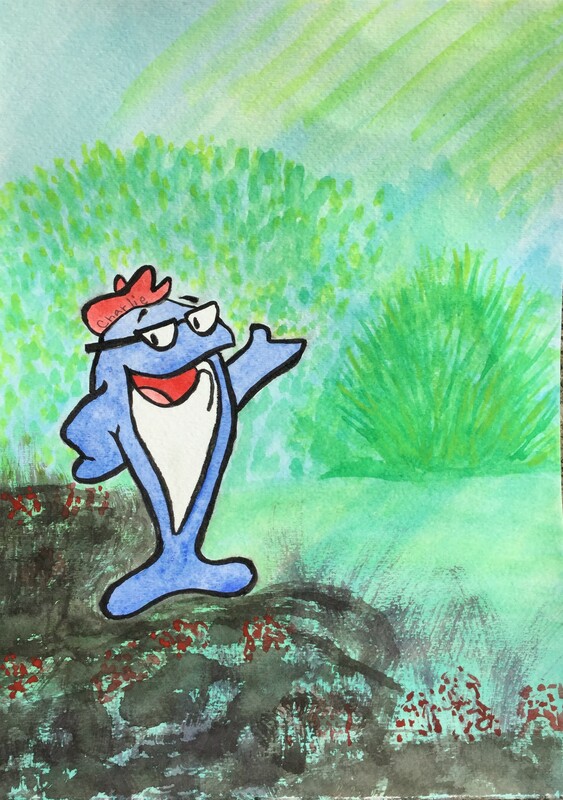 Yesterday, before I did the Moose drawing I traced Charlie, the Tuna fish (some of you older folks may remember those commercials) onto some watercolor paper and painted him. I have always loved tuna; my mom used to make the best tuna fish sandwiches I have ever eaten. She put sweet pickle relish, Miracle Whip, and chopped up boiled egg in it. I realize that may sound gross to some people, but we never had mayo in our house. For some reason, we were a Miracle Whip family. My family I have now has both in our house. One to satisfy the Southern born girl (me) and the other to satisfy my Illinois raised husband and my daughter who has decided she likes mayo and dill pickles better in her tuna or chicken salad. I don’t know what made me want to draw Charlie. Maybe it was the fact that his glasses are same kind my dad used to have and my son has now. Maybe nostalgia. Or maybe just for the halibut! HA! All I know is it was fun. However, my background wasn’t planned and could be better so who knows maybe I will do him again in a different part of the ocean. p.s. It is evening where I am right now, but all I know is it is 5:00 somewhere! p.s.s. Here’s one of the Starkist Tuna commercials I remember being on television when I was a kid! Posted on September 20, 2016, in Watercolor Paintings and tagged acrylic paintings, art, Chinese watercolor painting, Koi Fish, pencil, Sea turtles, Sumi-e: The Art of Japanese Ink Painting, watercolor painting. Bookmark the permalink. 4 Comments. I remember Charlie. That tuna recipe sounds delicious! When we were kids, we BEGGED our mother to buy Miracle Whip. My family was old school Hellman’s. Oh you poor children….so deprived of Miracle Whip! 😉 I have never liked the taste of mayonnaise! Whenever I get a deli sandwich I tell them to go extra light on it because I don’t like dry bread. It is a good recipe. I think she also put chopped celery in it sometimes.